An aphorism from English science-fiction writer Arthur C. Clarke flashes in the darkness: “Two possibilities exist: Either we are alone in the Universe or we are not. Both are equally terrifying.” The tremulous blue letters resemble a hologram displayed in the night sky, cut across by a falling star. Surrounded by a ring of fire, it falls into the centre of a European city, and curious passersby begin to congregate around the crater. From the falling smoke, there slowly emerges the metallic shape of the probe, apparently of extraterrestrial origin. Suddenly, a green gas begins to escape from the holes in its hull, thickening into a kind of spider’s web, which grabs the nearest onlookers and begins to pull them in the direction of the capsule. At that point, panic breaks out. The sequence described above, which opens the video game entitled XCOM: Enemy Unknown, references a classic topos of science fiction: an unprovoked and undeserved invasion from outer space. It repeats almost word for word the scene of the first encounter with a strange civilization from H. G. Wells’s classic War of the Worlds: the curious crowd gathered around the meteorite crater only to fall victim to sudden and incomprehensible aggression. It is true that the scale is much smaller, and the cylinder that falls from the stars does not blaze with deadly heat or carry passengers, but the analogy still seems quite apparent. Soon, the scene will be supplemented with further information– the purpose of the attack is not to murder but to abduct people, and the aliens are circling above in flying saucers. Thus, Wells’s classic plot is complemented by the equally established pop culture topos of alleged meetings with aliens, said to have taken place in the mid- and late 20th century in the US, from encounters between flying saucers and American aviation to the Roswell crash and reports of people being abducted, subjected to bizarre probes, and then released. These two threads quickly become interwoven. The player’s task is not to unravel the mystery of where the mysterious spacecraft come from (as Roland Barthes observes, they could have come from the Soviet Union), but to grab a weapon in order to stop the kidnappings, and then the attempted conquest of earth by an alien civilization. This is a Wellsian narrative, but transformed to such an extent as to make possible active resistance and victory by the forces who the player controls – the game will not have the British army helpless; the soldiers of XCOM are impeccably trained, and it is to them, not to an intervention by nature (or God? ), that humanity will owe its salvation. There are also a few acting in secret to stop a global panic from occurring – this is another ingredient borrowed from the tradition of UFO stories, invariably accompanied by the certainty that the truth is being hidden by the United States government, set forth most elaborately in the TV series The X Files. That association is anything but unwarranted, since this game is a new edition of UFO: Enemy Unknown, a 1994 release, a year younger than that American TV show and even if not directly inspired by it, a product of the same era, adapted, nearly twenty years on, to the sensibility and expectations of the contemporary gamer. The XCOM experience is heterogeneous– in keeping with the poetics of the genre (of strategy games with a strong narrative component) it does not offer the monochrome vision of the fictional world typical for story games, with an individual avatar through whose perspective we follow the entire plot progression. Instead, it offers three different ways of interacting with the story as it develops throughout play: film sequences in which successive events crucial to the plot take place, sequences dealing with managing the XCOM base, and tactical sequences, in which the player directly controls four, five, or six soldiers during a skirmish with hostile aliens. Though each sequence has a different level of interactivity, form of presentation of content, visual perspective and method of control, they together form a whole game-playing experience, so that any effort at interpretation must take into account not only the sequence in which they occur, but also the relationship between them. The tension between the three ways of conveying the story I have mentioned is only one of two important dissonances present in the game. The second spatial incoherence is the relationship between the narrative-aesthetic component of the game, here the narrative of the battle with the aliens, and the interactive-algorithmic ingredient, meaning the rules and the ways the reader exerts influence on the game. This problem was, for a long time, central to reflection and study of games and remains one of the key dilemmas in the discipline. I do not aim to summarize two decades of disputes over the place of narrative in the study of video games and their literariness, but it suffices to observe that a game offers a series of tools that facilitate independent generation of sequences of events with prefabricated plot points prepared by the designers, and a game’s interpretation can begin with an analysis of the rules of combination, analyze their power of persuasion and the devices by which the mechanism of the game attempts to imitate processes that take place in reality or interaction between the dynamics of the situation in a game and the process of understanding. There is, however, universal agreement that reducing a game to its narrative-aesthetic layer or concentrating on the text formed by finishing the game, the result of having consummated certain possibilities offered by it and skipped many others, is a scholarly error. Curiously, the opposite approach, putting aside the story in the interest of analyzing the rules and processes of the game, stirs no controversy, and has often been seen as a method with much to recommend it, particularly in the early phase of the development of game studies. It is founded on the feeling that all forms of culture called “video games” share certain common features, and narrative or aesthetic distinctions are superficial and complicate the discovery of these forms’ essential properties – they should thus be rejected in the name of intellectual sincerity. I, however, feel that meaningful as such a gesture may be in the course of attempts at constructing definitions, it in effect prohibits analyses of particular cases, which should take the aesthetic perspective into account as well as algorithms, and should pay particular attention to their interaction, especially where potential contradictions become evident. The gamer’s position within the world of XCOM is ambiguous. On the one hand, there are clear narrative circumstances that allow the player to be identified with the leader of the XCOM organization: the game issues a series of verbal messages directly to the person playing, in which he is addressed by that title. Megaphones are also heard in the underground base, repeatedly summoning the leader to a particular room – that is how the game guides the player’s attention. Some of the film sequences also suggest that the person playing is one of the heroes, as they simulate a first-person perspective. The game uses these sequences to present key personnel in charge of the XCOM project: the liaison officer, the head of research, and the chief engineer. The three films that introduce them suggest meetings between each of them with an unseen, silent figure located more or less exactly where the player seated before the monitor is. This is a classic device in video games, which often and eagerly resort to point-of-view shots, suggesting that the player and the hero occupy the same place in space. In this particular case, however, such suggestions are incidental and inconsequential. The sequences depicting how the base is run present a transversal cross-section of it, disturbingly reminiscent of an anthill, and the movement from place to place involves a series of approaching and distancing shots that make no attempt to present a semblance of one individual’s movement. Likewise, the film sequences are inconsistent: some use the point-of-view device, while some give no intimation that the XCOM leader is present at the site of what is taking place, and several even suggest outright that he is elsewhere. This is how the action proceeds in the long film in which his three subordinates discuss possible actions to be taken by the organization and decide to push for one of them; the liaison officer commits to relaying their choice to the leader (i.e. the player) and convincing him to pursue that course. Similarly, the tactical sequences in which the player leads several soldiers in a direct attack, reveal no evidence of the leader’s physical presence; and while the player has complete control over the commandos as long as they keep their wits about them – he loses it when they succumb to panic. It is not difficult to understand the reluctance to include an avatar representing the player in a game of this type – the absence of one allows the player direct access to information as well as other capabilities that no particular person could possess (for example, he controls what happens on a battlefield). Many games involving the management of resources for the purpose of level-headedly developing some structure, usually a city, address the player using a title that fits the game’s aesthetic and conceit: he is the mayor, when building a metropolis in the Sim City series, or “el Presidente” in Tropico, where he possesses dictatorial powers over a fictional Caribbean island. What stands out as unusual here is the use of point-of-view shots in the film sequences – it seems intended to heighten the player’s emotional engagement and sense of personal responsibility for the course of events. That course of events proceeds as follows: XCOM is an elite military unit financed in secret by 16 countries around the world. Its clandestine mission is protecting the Earth from possible aggression from outer space, and it therefore springs into action when the first phase of the invasion begins. Initially, the aliens’ activity is limited to abducting humans, but after they soon begin committing massacres against civilians on a regular basis in order to spread panic throughout the world. The organization run by the player attempts to secretly eliminate the invaders and keep information about the cosmic invasion from reaching the public. It conducts scientific experiments on the aliens’ technology, and in the process, discovers that their purpose is the incorporation of Earth in a conglomerate of planets conquered by a mysterious older race of beings who lack material bodies. Members of that race are waiting on an enormous space ship orbiting the planet, undetectable to the human eye. Having established the ship’s position, XCOM sends an elite team into space to eliminate the threat using firearms and their psionic powers. The Earth is saved! At the level of game-playing, this progression presents itself in the following fashion: the player begins with an introductory tactical mission, during which he commands four soldiers and himself follows orders exactly as instructed, having no freedom of choice. In the course of the mission, as a result of some ill-considered commands, three of the four subordinates are killed, but it concludes with the successful elimination of a group of aliens. There follows a strategic sequence in which the player watches a series of films introducing the main characters, and makes decisions about the course of scientific research and investments in engineering. Next, he begins discreetly keeping vigil over the world, watching a hologram of the earth’s globe on which threats are shown. Finally, there is another conflict with the aliens, who attack three places at once – he must choose which of them he will rush to help. This leads to another tactical sequence, in which he commands a group of soldiers without outside guidance. At the end of the action, some of his subordinates are promoted: the leader decides what their new skills will be, reviews the scientific research and investments, and then returns to monitoring the globe. The sequences alternate with fragments of film that introduce important plot elements and a monthly debriefing at which the nations comprising XCOM award further subsidies or, if the level of panic among the population is too high, withdraw from participation. If eight nations leave the council of the organization, the player has lost. He wins, on the other hand, when scientific research leads him to the hidden spaceship and he achieves victory in a difficult tactical mission that constitutes the last act of the game. Even this degree of generality allows us to venture a few interpretative observations. Firstly, both at the level of plot and at that of play, there is an essential opposition between cool, rational reason and blind panic. To achieve success, the player must have a great deal of information at his command and constantly compare various relevant factors. He must calculate the level of panic in various countries, measured numerically, and the time remaining until the monthly debriefing – his awareness of the situation allows him to reduce that level before a terror-stricken country withdraws funding for the organization. Significantly, the most important way of calming the citizenry is increasing the availability of information obtained using surveillance satellites placed by XCOM over the territory of the country in question. In terms of the trajectory of play, this move leads to a reduction in the factor of fear and an increase in the financial support given by that country. Furthermore, attaining satellite coverage of all the countries of a given continent earns a special prize. 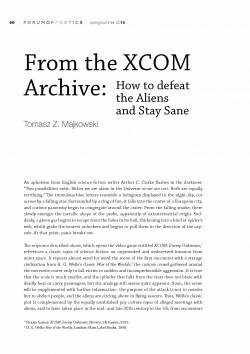 At the level of plot, this fact is commented on in the following way: thanks to its satellites, XCOM is able to track a UFO in the air and stop it from abducting people. The fact that citizens are unaware of the conflict taking place receives no commentary. Another important component of the metaphor of rationality is the need to conduct scientific research. The research is embodied by a young woman with a German accent whom the leader assigns successive projects and who reports on their conclusion. The mechanics of each project are analogous: finishing it takes a certain amount of time and results in the display of a report and unblocking of new possibilities, primarily in engineering. There are two important exceptions– some experiments do not increase the options available to the player but push the plot forward. They then culminate in a film that introduces the new plot thread. The other exceptional kind of research is the autopsy on a new kind of alien, which is announced by a sequence presenting the body on the autopsy table, accompanied by a short description of the distinguishing characteristics of this species. The result resembles technological research in that it creates possibilities for producing new equipment. A typical feature of the procedure is its 100% effectiveness – if you give a group of researchers enough time, they always get results – and the exclusivity of the empirical method. The lead researcher does not formulate hypotheses but only conducts analyses of the objects and bodies found. She is, furthermore, marked by a certain coolness – not only does she dispassionately slice up the bodies of the alien visitors, she repeatedly argues that the life of a soldier has significantly less value than scientific research. Progress requires sacrifices. In the tactical sequences, the problem of access to information and the need for rational decision-making are very plainly presented. The field of battle, to be sure, is presented in isometric graphics, but also only in broad outline – the areas outside the soldiers’ vision are obscured. The basic task of XCOM commandos is to find the enemy, who is hiding in various nooks and crannies. The relevant moment is always announced: a message is displayed on the screen, and sometimes the flow of action is interrupted by animation showing the enemy. The player loses control for a moment and is forced to observe as his newly discovered antagonists escape to a defendable position. At the same time, enemies who are not discovered remain inactive and do not pose a threat. That mechanism rewards careful behaviour, protective and defensive, calculated to gradually and methodically get rid of the enemy. It has another valuable aspect as well: because the number of battlefields is limited, and the appearance of aliens a repeated occurrence, a thorough advance knowledge of the map where the action plays out gives the player a real advantage. Using lessons learned from previous experience, he can easily optimize his strategy and avoid being surprised. Two motifs underscore the primacy of rational reasoning. The first of these is the panic present at all levels of the game. In its filmic layer, the panic is relatively less in evidence, with the leaders of XCOM keeping cool, though they look with anxiety at the transmission of the slaughter of an innocent city that precedes the first “panic mission” – an assignment involving the protection of the murdered population, in which, in contrast to later tactical episodes, we see citizens of the metropolis under attack, helplessly crouched in sundry hiding-places and waiting for one of two possible fates: either an XCOM soldier will come close enough to give them the order to flee, or they will perish at the hands of the aliens, since fear deprives them of their initiative. The commandos controlled by the player are also susceptible to that emotion when they are badly wounded, witness a comrade’s death, or encounter a particularly terrifying creature from space. Panic manifests itself in a cry of horror and a quickened pulse as well as, in the gaming layer, the loss of control over the soldier, who acts randomly and thus not only exposes himself to the risk of death, but also makes the player’s task more difficult, making him poorer by one pawn. In fact, whole countries fall into a panic, when the aliens wreak a certain degree of havoc in them. Nations seized with fear withdraw from the joint defence project – thus behaving irrationally and, like those soldiers, depriving the player of the ability to control events. Besides fear, the game contains a thread about control of weak minds by the reason of the strong. Some of the aliens manage to take control of the player’s soldiers during a tactical mission and turn them temporarily into enemies. At the level of plot, this motif is singularly meaningful since that is precisely the method used by the cruel master race of aliens in its conquests. Rational behaviour, on the other hand, demands subordination of one’s own will to the collective will of XCOM, embodied by the player: the soldiers are deprived of their status as subjects and causative agents beyond the subjectivity and agency they manifest in brief moments of panic. At the same time, however, another interpretation of total control appears, depicting it as sinister, because imposed by the evil strangers from outer space. To soften the ironic accent of this thread, the game introduces a clear distinction, in that a commando controlled by an alien behaves thoughtlessly. His new master does not tend to his servant’s welfare. At the level of the game, he exposes him to danger: a soldier whose mind is taken over by his opponent, behaves irrationally and foolhardily, does not take cover and walks straight into the sights of enemy guns. At the level of plot, the game offers a commentary on such behaviour during the final mission, as the player receives abundant information about the iniquities committed by the victorious invaders against other worlds, whose enslaved and transfigured inhabitants are dying from the bullets of earthly commandos. That leads us to the second important theme of the game: caring. Notwithstanding the exaltation of instrumental reason and harangues about the need to make sacrifices for the sake of progress, XCOM employs a series of techniques to heighten the leader/player’s concern for the state of the world and the good of his own soldiers. That end is served by the suggestions in the film sequences that the player is not in the position of a detached, impersonal puppeteer, but embodies a particular person, in whose hands the fate of the world has been placed, as he is constantly reminded by helpful advisors and the XCOM council. For that reason, also, the game takes considerable pains to individualize the soldiers. XCOM commandos can be men and women of different skin colour, from any one of several dozen countries of the world, with their nationality signalled by a flag insignia on the nape of their neck. Each one has a unique name and surname and a combination of facial features and hairstyle that distinguish him or her from the others. Once they acquire enough experience killing aliens in a series of missions, they are given pseudonyms – the game’s way of underscoring their increased familiarity and ease with firearms. This very simple mechanism is intended to elicit the player’s solicitude for the fates of his subordinates, intensified at the gaming level by the mechanism of experience. The successful completion of multiple missions not only allows the player to choose specializations for each commando, but also ensure the acquisition of new skills. By managing to keep his charges alive, the player increases both the value of each soldier and the bond between soldier and player. The surnames of the fallen appear on a list displayed to the accompaniment of funereal music. This emotional relationship to the pawns is exploited in two ways. Firstly, in that a positive ending depends upon the sacrifice of one soldier, who gives his life after having been carefully saved by the player throughout the game, in order for Earth to be safe, raising the emotional temperature of the finale. Secondly, the game can be played in a mode that prohibits previous plays from being read, in which case the soldier’s death becomes irreversible. That version of play is intended, or at least declared to be, for particularly ardent and skilful players. In spite of its undoubted effectiveness, the mechanism of building up the player’s emotional attachment to XCOM soldiers reveals yet another important paradox: the differentiation among soldiers occurs only at the aesthetic level. In terms of deeper concerns, gender, vocal timbre, skin colour and nationality are relatively unimportant, and in fact all of the soldiers begin the game equipped with an identical set of properties. Some of them become differentiated later on through the acquisition of experience, but that is a simple matter of professional development, a rational, intentional process, presenting the same metaphor of growth through the attainment of knowledge that we saw in the thread of scientific research. Otherwise, the differentiation of the member states on XCOM’s council is similarly superficial; they offer different amounts of money, but follow the same political rules, confined to the theme of growing panic. Their common voice is represented by a bald white man whose face is always in shadow. The alien invaders show a much higher degree of differentiation from each other, both at the aesthetic level and at those of plot and game mechanics. The scientific officer even sighs, upon seeing one of the many species, that the existence of such a strange life form rules out hope for ever establishing any kind of pattern of shared traits among such invaders. Most of these cosmic strangers are hybrids – beings that look like crosses between people and reptiles, part bio-mechanical, part cybernetic, and part animal. Each of them has unique abilities expressed in the language of their behavioural norms as well: some control minds, others spit acid or are marked by particular forms of movement. In connection with this fact, the player must correctly recognize the properties of each new alien race and then adjust his tactical decisions accordingly. Learning to distinguish among them obviously depends on the trajectory of the game; as the action develops, it must offer the player new thrills and higher levels of difficulty. The process of differentiation is commented on at the aesthetic level, which underscores the grotesque variety among aliens, and the plot, whose development eventually explains the mystery of how there came to be such a heterogeneous group of invaders. They are in fact the product of experiments by the villainous rulers of outer space, who have unscrupulously transformed whole races of beings. Here we can once again see a parallel between the actions of these antagonists and the opportunities presented to players by the game. After all, the player influences the path of each soldier’s development and adapts their potential abilities to suit his own needs. Moreover, though the player has no control over the soldiers’ nationality or gender, he can use an editing function to remake the algorithmically set appearance of each soldier, changing the face, voice, hairstyle, or skin colour. In later phases of the game, he can also transform some of his subordinates into telepaths – though they must have the proper predispositions, as determined by the game’s algorithm at random. Exactly like the races of aliens, among whom only some have psionic powers that the race of overlords in charge of the invasion is able to use to their advantage. XCOM thus deals with a conflict between two equal opponents using more or less similar methods. Both sides act in secrecy, following the dictates of faceless superiors; the leaders of the invaders hide behind masks, while the XCOM project is run by the council’s mysterious, shadowy spokesman and the player-leader, whose character never appears on the screen. Both sides strive for technological superiority, guaranteed by empirical science, and use the results of their discoveries to reshape their subordinate soldiers, who are deprived of their own will. In both cases, military success means the triumph of rationality. Despite the similarity in their methods of operation, the game also allows a clear distinction to be made beyond the simple dichotomy of evil aggressors and noble defenders. Firstly, XCOM noticeably suggests that the leader-player cares about his subordinates and tries to keep them alive, while his opponent sends successive underlings to their deaths. Secondly, though both opponents are agents of unity, they show different understandings of that concept. For the aliens, the price of unification is submission: various races have been harnessed and incorporated into a cosmic empire of evil. The people of Earth cooperate because that solution is dictated by reason, and they abandon cooperation when brute fear gets the better of them. This kind of cooperation is made possible by the fact that the differences between groups of human are truly cosmetic and do not affect their fundamental identity, to use the language of the principles of the game. At the same time, the aliens are differentiated at every possible level, making it impossible for them to understand each other, let alone the inhabitants of Earth. What appears to be a union of many cultures is in fact only a manifestation of violence perpetrated by ruthless power. In constructing its narrative about security, XCOM retains the themes, but reverses the metaphor of its two source narratives. Absent here are the desperate and doomed struggles with the technologically superior antagonist whose motivations remain murky, and the thread of miraculous salvation, from Wells’s War of the Worlds; thus the game avoids touching on the topic of colonialism and retreats from metaphysical questions to a safe position in favour of instrumental reason, though in the process it raises the disturbing question of the role of free will and the need to submit to an all-powerful supreme authority. It does so in passing, however, somewhat half-heartedly, suggesting that as long as the overseers’ goals are noble, their subjects should submit completely to them. This is related to the game’s reversal of the preoccupation, found in its second key intertext, The X Files, with suspicion. Here, the conspiracy in which the governments of the world have colluded springs from the most pure-hearted motives possible. The authorities’ intentions are innocent, and though they struggle with organizational problems and sometimes suffer minor defeats, they are the only guarantors of safety. Surveillance and obedience are in the citizen’s best interest. Differences between cultures are merely superficial and can be overcome through the rule of reason. Suffering – the death of individual soldiers or the surrender of one of the countries to sheer fear – has meaning, since it brings us closer to the final victory over the forces of evil, which can be defeated since their varied surface is merely a front for the evil will of their absolute overlords. In other words, UFOs are once again coming over from the Evil Empire. XCOM: Enemy Unknown, a 2012 video game (actually a reboot of a game released nearly two decades earlier), presents players with a relatively stereotypical task – they must defeat cosmic invaders. It also proposes a clear, linearly-presented plot and an intriguing mechanism of concern for the individual soldiers who are fighting the ignoble aliens. An analysis of the relationship between the rules and procedures of the game and its narrative-aesthetic layer allows for an interpretation of its central themes, chiefly, the problem of guaranteeing security, the dilemmas faced by a multicultural society, and instrumental reason as a tool in ruling over others. Dealing with these issues by means of typical videogame techniques, XCOM becomes an important link in the chain of narratives about invasions from outer space initiated by War of the Worlds, a critique of colonial institutions written by H. G. Wells in 1898. A description of the methods by which these classic problems are adapted to the needs of the contemporary audience of popular culture enables me to demonstrate the analytical tools used in interpreting video games. Firaxis Games: XCOM: Enemy Unknown, Novato: 2K Games, 2012. H. G. Wells: War of the Worlds, London: Plain Label Books, 1898. The history of hysteria relating to flying saucers is summarized in brief by Wiktor Stoczkowski in Des hommes, des dieux et des extraterrestres: éthnologie d’une croyance moderne, Paris: Flammarion, 1999. Roland Barthes, Mythologies, trans. Richard Howard, New York: Hill and Wang, 2012, 38-40. The X Files, dir. Chris Carter, FOX 1993-2002. Mythos Games: UFO: Enemy Unknown, Hunt Valley: Microprose, 1994. Jan Stasieńko has discussed the popular study of genres in video games; see J. Stasieńko: Alien vs. Predator?, Gry komputerowe a badania literackie (Alien vs. Predator? Computer Games and Literary Studies), Wrocław: Wydawnictwo Naukowe DSWE, 2005. It results from, on the one hand, early work in non-academic video game criticism, and on the other hand, effective marketing strategies by game producers. It focuses primarily on dividing games in terms of how material is presented as well as the dominant form of interaction – for example, the FPS (First Person Shooter) genre differs in terms of the perspective in which the world of the game is presented (the camera mimics the protagonist’s gaze) and the dominant model of interaction, i.e., shooting at his opponents. HOPA (Hidden Object Puzzle Adventure) games offer a series of enigmas and sequences in which the player must find selected objects within a jumbled screen. Successfully solving those unblocks the next part. With its conventional nature and lack of coherent criteria, that “popular study of genres” can be a useful tool in non-academic game criticism; its scholarly usefulness is limited at best. A term introduced by Mary Ann Buckles, pioneering scholar of video games, to signify games with a clear tendency toward plot and differentiate the from computerized imitations of classic games (such as computer chess). See A. Ensslin, Literary Gaming, Cambridge: MIT Press, 2014. Piotr Sterczewski provides a partial summary in “Game studies, tutorial: wprowadzenie do multidyscypliny” (Game Studies Tutorial: Introduction to the Multi-disciplinary), Czas Kultury 185 (2/2015), 84-90. E. Aarseth, Cybertext. Perspectives on Ergotic Literature, Baltimore: JHU Press, 1997. A. R. Galloway, Gaming. Essays of Algorithmic Culture, Minneapolis: Univ. of Minnesota Press, 2007. I. Bogost, Persuasive Games, MIT Press, Cambridge 2006. 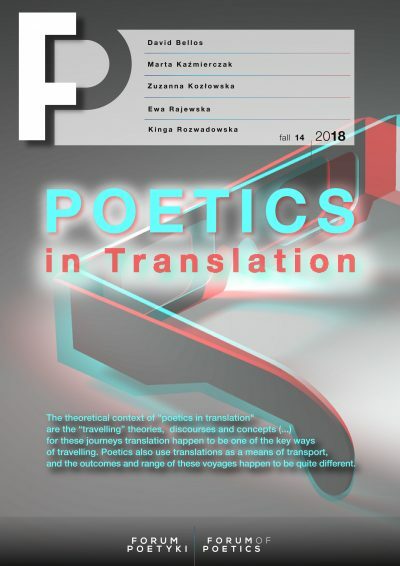 J. Arjoranta: Real-Time Hermeneutics: Meaning-Making in Ludonarrative Digital Games, Jyväskylä: University of Jyväskylä, 2015. http://urn.fi/URN:ISBN:978-951-39-6164-0, (last accessed: 11.02.2016). J. Juul, “Games Telling Stories? -A brief note on games and narratives,” Game Studies 1 (1/2001), online: http://www.gamestudies.org/0101/juul-gts/,(last accessed: 11.02.2016). “Avatar” is now the accepted term for a video game protagonist who is simultaneously the tool of the player’s causative will and his vehicle in the game’s represented world. See Rune Klevjer. What Is the Avatar? Fiction and Embodiment in Avater-Based Singleplayer Computer Games, doctoral thesis, University of Bergen, 2006.